Civil litigation is generally costly and time-consuming. Civil procedure itself is often the culprit in this regard. The Hon Robert Clark, Attorney General for the State of Victoria, in this article discusses reforms he is or has been undertaking on behalf of the Victorian government in the areas of expert evidence, costs and commercial arbitration. He concludes by indicating that the reforms undertaken in these areas are parts of continuing efforts to provide just, cost-effective and timely processes for resolving civil disputes in Victoria. The difficulty of judgment writing at appellate level is often overlooked by lawyers and others alike. Not only must the case in question be disposed of by giving adequate reasons but thought must also be given to the precedent value of the judgment for coming generations. The burdens involved are considerable, and increasingly so in this electronic age. However, clarity of expression remains the central focus. In this article Justice Allsop, President of the New South Wales Court of Appeal, discusses the various issues involved and the problems encountered in ensuring clarity remains the principal concern for appellate judges. He notes in this regard that care and effort should be taken to examine rigorously what should be expressed and to enunciate this clearly. The Federal Court of Australia may largely lay claim in this country to the adoption of the docket system for the hearing and pre-trial management of cases. A designated judge manages designated proceedings from commencement to disposition. But there can be issues arising out of this case management system, which can be exacerbated particularly when dealing with litigants in person. Indeed, litigants in person raise special issues of their own. One such issue is what leniency, if any, self-represented litigants should receive in relation to matters of practice and procedure and how to ensure an opposing practitioner is not unfairly disadvantaged. A further issue is that of civility – by practitioner and self-represented litigant alike. Justice Griffiths of the Federal Court discusses these and other similar issues in this article. Commercial litigation has grown in importance for a variety of reasons and particularly in Australia since the enactment of the Trade Practices Act 1974 (Cth) – now the Australian Competition and Consumer Act 2010 (Cth). However, largely the remedies available have remained the same. Significantly, these are remedies that developed at a very early time in our law. In this article, Justice McDougall in an address to Young Lawyers on business law gives a most helpful summary of the equitable remedies and of some of their limitations. In the course of his most interesting coverage he raises an intriguing question – not resolved anywhere – of whether there can be such a thing as an interlocutory declaration. In this most entertaining article, originally given as an address, the Hon Peter Heerey AM QC sets out various issues that arise out of the conduct of a hearing. While the article’s specific context is administrative appeals, the discussion on expert evidence is most insightful and useful in the civil litigation context. Other discussions of relevance to civil litigation include time limits on cross examination and the value of cross examination itself. It ought not to be overlooked that much civil litigation in Australia today is conducted before tribunals so discussion of matters arising in the administrative law context is not out of place. Nor is literary reference out of place either, as will be seen. This article examines the Australian practice of ordering foreign residents to provide security to access Australian courts. It reviews the practice’s application in England and Australia since it was developed in the late 18th century and the obstacles to foreign enforcement that justified its creation. It examines the reasons underlying the English courts’ departure from the traditional rule and contemporary considerations English courts apply in determining security applications against foreign residents. It empirically examines the practice’s contemporary application by Australian courts and concludes that, overwhelmingly, Australian courts will order a plaintiff resident overseas to provide security if they do not own realisable assets in the jurisdiction sufficient to satisfy an adverse costs order. It concludes that legislative, economic, and technological advances since the practice was developed warrant judicial reform to the entrenched practice of ordering foreign plaintiffs to provide security for costs merely because they reside outside the court’s jurisdiction without assets in Australia. For the pdf version of the table of contents, click here: LOLA – JCivLP Vol 1 Pt 4 Contents or here: WAU – JCivLP Vol 1 Pt 4 Contents. 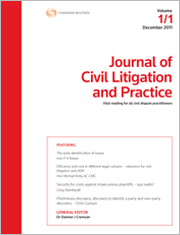 Want to know what will be in the new Journal of Civil Litigation and Practice?